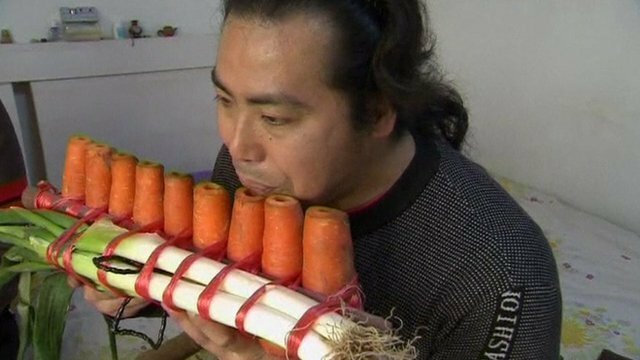 Nan Weidong and Nan Weiping, two brothers from Beijing, have carved out an unusual career – making musical instruments from carrots, potatoes and other vegetables. The Chinese brothers grew up surrounded by vegetables on a farm in central China with a music teacher father. Now they specialize in making and playing musical instruments fashioned from vegetables. Nan Weidong and Nan Weiping have been making playable flutes with everything from leeks to carrots. Frequent projects see them using a sweet potato as an ocarina, a bamboo shoot as a flute, and a yam might become a whistle. Nan Weidong and Nan Weiping make a living from their instruments which have seen them appear on Chinese talent shows and other high-profile performances, which pay up to $8,000 a time. Each does, however, require a new set of instruments, as the vegetables begin to rot after just a few days. The brothers learned to play conventional instruments from their father, a music teacher, when they were children. Now Nan Weidong and Nan Weiping live and work in a narrow apartment in Beijing, drilling holes in carrots, marrows, lotus roots and Chinese yams to make vegetable instruments that they perfect using an old electronic tuner. The Nan brothers, whose repertoire ranges from traditional Chinese flute music to modern pop to western folk songs like Auld Lang Syne, have appeared on talent shows in China and can receive payments of 30,000 to 50,000 yuan ($5,000 to $8,000) for a performance.